I'm on record saying The Glorious Sons are on of the best rock bands of this century. Why See The Glorious Sons? 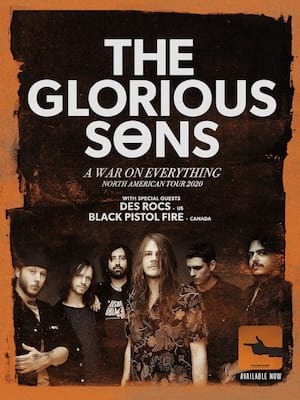 Hard rocking Canadian quintet The Glorious Sons burst out of Kingston, Ontario with a vengeance in 2011, winning over legions of ardent fans with their heady blend of rootsy alt-pop and blue-collar trad rock. Their no frills, hard-hitting musical style has evolved over the years, culminating in the critically acclaimed release of 2017's 'Young Beauties and Fools'. After a busy summer playing festivals around the world, the outfit are keeping the pedal to the metal with a headline Canadian winter tour, featuring special guests The Beaches. Known for high-octane concerts that are every bit as relentless as their records, The Glorious Sons have honed a finely tuned live show after almost a decade of constant touring. Frontman Brett Eamon's vocal howl and mean harmonica skills soar amidst the band's trademark five-part vocal harmonies, pounding rhythms, gritty blues-tinged riffs and anthemic choruses. 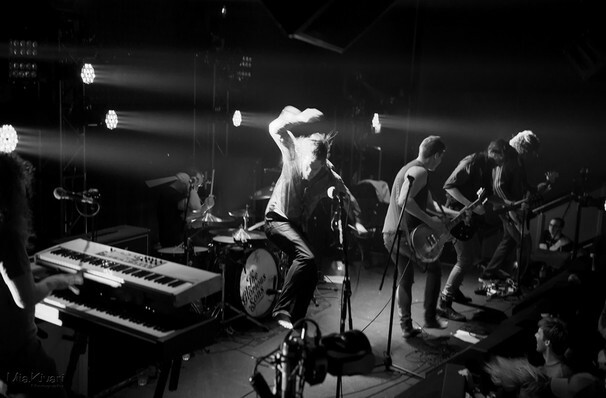 Rock and roll ain't dead, and these brave revivalists prove it with every raucous note. Sound good to you? Share this page on social media and let your friends know about The Glorious Sons at Saint Andrews Hall. Please note: The term Saint Andrews Hall and/or The Glorious Sons as well as all associated graphics, logos, and/or other trademarks, tradenames or copyrights are the property of the Saint Andrews Hall and/or The Glorious Sons and are used herein for factual descriptive purposes only. We are in no way associated with or authorized by the Saint Andrews Hall and/or The Glorious Sons and neither that entity nor any of its affiliates have licensed or endorsed us to sell tickets, goods and or services in conjunction with their events.